The Black-Eyed Susan Vine is a tender, evergreen, twining vine that is most often grown as a long blooming annual. If grown as an annual, they will quickly scramble up to a height of six feet. In frost free climates they can reach 20 ft. as long they have a support to grow on. 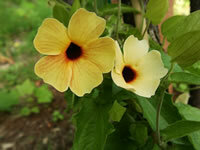 Black-Eyed Susan Vines have dark green, arrowhead-shaped, 3" leaves. 1½" bell-shaped flowers with maroon or deep purple centers, well into the fall. Black-Eyed Susan Vines make awesome, blooming ground covers and will quickly cover anything they can climb on, with flowers. They grow well in hanging baskets and planters that can be brought indoors for the winter where they will continue to bloom as long as the temperature remains above 60° and they get several hours of full sun each day. Black-Eyed Susan Vines are only hardy in USDA zones 9-12.
except in hot summer regions where they will require shade during the afternoon. or in a good quality potting soil if they are grown in planters. If you want your Black-Eyed Susan to climb, set up a trellis or other support before you plant! Water regularly and thoroughly during the growing season, especially during the first year. Container grown plants must never be allowed to dry out completely. These vining plants do not tolerate drought well. A layer of mulch will help to retain soil moisture. Feed every 2-3 weeks while in bloom, using a ½ strength solution of a soluble, bloom type fertilizer (3:1:5). 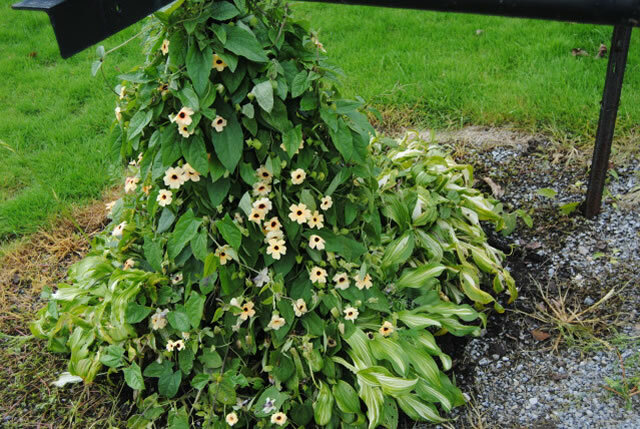 Black-Eyed Susan Vines can be trimmed lightly at any time during the growing season. Watch for scale, spider mites and whiteflies on indoor grown plants. New plants can also be produced by simple layering. Pin a low growing stem to the ground, using a piece of stiff wire bent into a U, leaving the last 6 to 12 inches of the stem exposed. Cover the pinned area with soil, then bend the tip sharply into a vertical position and nick the bark on the underside of the bend. Provide a stake to hold it in place. Once the layer is well rooted, it can be severed from the parent and moved to another part of the garden. danger of frost has passed in the spring. Start seeds indoors 6-8 weeks before the last frost date.